Presumably, if there is anything we can speak about using human language, we could place that thing either in the set (bucket) of Physical Things or that of Abstract Things. We might further break down the physical universe by differentiating matter from dark matter. We can conceive of nearly anything, especially the things we can perceive in our immediate space, including ourselves. We can think about things that are not seen, including abstract concepts such as freedom and privacy, places such as the core of our planet and unseen beings such as God. Whether a thing can be “known” or not is not particularly relevant. More important questions regarding any knowledge fragment are: “How do we conceive it?” and “What is the value in possessing it?” The Geosphere embodies everything physical associated with this earth. This includes things that are biotic and abiotic: a large number of organized particles of matter. The biosphere applies only to corporeal living things: plants and animals. The noosphere is a living thing that is neither biotic nor (technically) abiotic as it has no particles. Vladimir Vernadsky (background) and Teilhard de Chardin (Bio), describe a noosphere: the “sphere of human thought”. I have probably used the word Cognosphere in one of my posts, referring to the body of knowledge of humankind. I have definitely addressed the distinction between mind and brain. It is everyone’s brains, then, that are the primary repositories of content in the cognosphere, and the contents are growing. Importantly, the cognosphere, noosphere and “truth” have a significant intersection in “known truth”. Outside that intersection are unknown truth and known fictions. The mind is more cosmic, more expansive than the brain, and it’s unified domain has been called the noosphere. This is more than something we possess: it is a living, breathing, burning mass of shared mind. You can watch it on your favorite social media channel, and almost see how it morphs humanity into something it wasn’t last week. The noosphere contains the facts, fictions, metaphors and illustrations to which we assent. The truth to which we assent and the fictions, whether acknowledged as fictions or held as truth, combine to form a rich fabric that shapes our experiences and the institutions we create. The cultural morass in which we collectively embrangle ourselves is an inevitable expression of the noosphere. 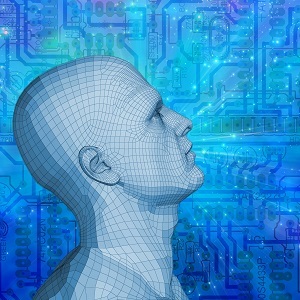 Artificial Intelligence may be confined to machines, or not. Systems smart enough to assemble new ideas and associations will contribute to the noosphere. This is not a bold assertion! Machines already profoundly shape the human experience. Witness Henry David Thoreau‘s reflections on the advance of the industrial age. He beautifully spoke of the impact of technology and human expansion on the noosphere. “If a man walks in the woods for love of them half of each day, he is in danger of being regarded as a loafer. But if he spends his days as a speculator, shearing off those woods and making the earth bald before her time, he is deemed an industrious and enterprising citizen.” Witness further the profound impact of Steve Jobs’ introductions of the iPod, iPhone and iPad to the noosphere as objects within it and mechanisms of its expansion. When we truly pass from the information age to the age of knowledge, we can anticipate intensified self-awareness in the noosphere, especially to the extent that we can capture and keep metadata associated with the global consciousness such as: “Where did this fragment of knowledge originate?” and “Where can I validate this assertion?”. Fasten your seatbelts -there’s turbulence ahead. Posted by Joe Roushar in Cognitive Science, Consciousness, Knowledge, Neuroscience, Ontology, Philosophy, Science, Social Interaction, Technology , Followed with No Comments.